Cute lights, and QuNeo's XY touch capabilities are interesting, but overall it doesn't live up to the hype. Low profile, very portable. Uniquely sensitive pads. Multicolour LED feedback. Controls can be a hinderance. Doesn't seem to fulfil any particular need. QuNeo is an LED-rich (251, actually) MIDI controller with 27 touch-based controls including pads, sliders, and rotary 'knobs'. They call this a 3D multi-touch pad controller; the gimmick is that the pads are sensitive to note-on, velocity, pressure and 'location' - the XY position of your finger on the pad. It has the same footprint as an iPad and it's unusually thin, making it the most portable multi-function programmable controller around. "There's a downloadable editor app, where you assign MIDI channel, note and CC"
There's a downloadable editor app, where you assign MIDI channel, note and CC. Each pad's separately assignable, and QuNeo has 16 presets. Also downloadable are templates for Live, iPad (BeatMaker and iMS-20), Logic, Reason, Traktor and Serato. QuNeo connects with an iPad through the camera accessory or with an adaptor. If you don't dig the templates, something called COMA mode enables the pads 'send' function one at a time, for easier assignment with your DAW's MIDI learn function. This is even more important given that QuNeo's 16 pads can be subdivided into fours, in Grid Mode. QuNeo is advertised as 'working with' OSC, but it doesn't send OSC from the hardware, requiring the QuNeOSC Max application to 'convert' MIDI output to OSC messages. 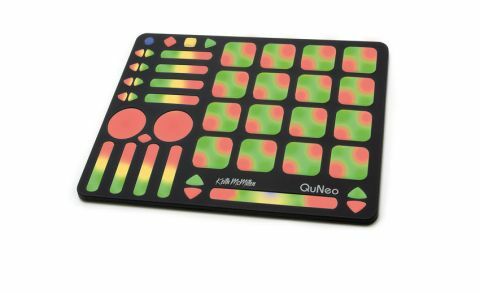 With Live 8, QuNeo functions as a reasonable but not very exciting MIDI controller. There are a lot of controls on the template, but their functions don't correlate to QuNeo's layout very well, meaning that you're never quite sure what each pad (and the myriad pressure, velocity and movement options) is doing. "It was great for finger-style drum parts: the pads are superbly suited for this role"
The controls need more pressure than expected to get them working, and aren't especially rewarding as a tactile experience and you soon realise that you're working with spongy, feedback- free, squidgy strips and spots rather than the genuine knobs, buttons and faders that made you want to buy a hardware controller in the first place. We wouldn't use QuNeo for Live clip launching, for example, but on a more positive note, we had performance fun sending notes and CCs to change pad colour and brightness, and it was great for finger-style drum parts: the pads are superbly suited for this role. QuNeo's well built, but we don't see the logic behind the design. It's a physical controller that's too 'virtual' in its feel and layout. Live users would better enjoy Lemur on iPad, and then of course there's the new proper Push hardware, due in early 2013. As for the likes of Traktor, yes, it works but this is no jogwheel and knob-laden NI S4. But if you really need velocity and XY sensitivity in a small package, QuNeo will prove useful though not essential.